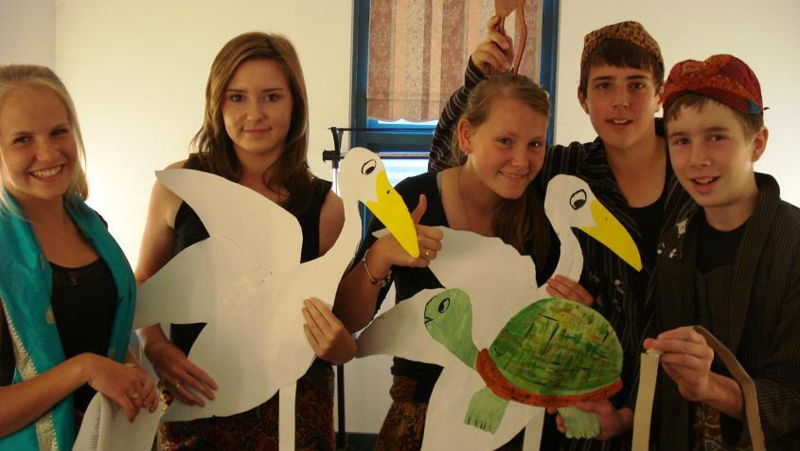 On Thursday two Galen groups went to Benalla to the ‘Celebrating Languages Festival’. The Year 10 Italian group used Commedia dell’Arte masks to perform a skit from the series ‘Muzzy’. The Indonesian group used puppets to retell an Indonesian Children’s story ‘The Talkative Tortoise’ There were many acts, African, French, Japanese, Indonesian and Italian. We enjoyed watching all of these groups, but particularly enjoyed the group that was learning English in Shepparton. They sang the Australian Anthem, My Island Home, I am Australian and finished with a song about crossing the water and starting over again. After each English chorus, students from the group went up and sang the chorus in their own language. There were students from Syria, Sri Lanka, India, Africa, China, Pakistan and per- haps a few others. This was a very touching performance. The day finished with the Asanti African Dance Group. They were from Ghana in West Africa. They danced and played music and we all joined in! It was awesome!